Prior to 2006, one of the main issues the primary school faced was absenteeism from pupils after the lunch break. The reason for this was some families could not afford breakfast or lunch for their children. These children were too hungry to concentrate in the afternoon and often disappeared in search of food. They sometimes offered to dig in a neighbour’s field in the afternoon in return for some food. 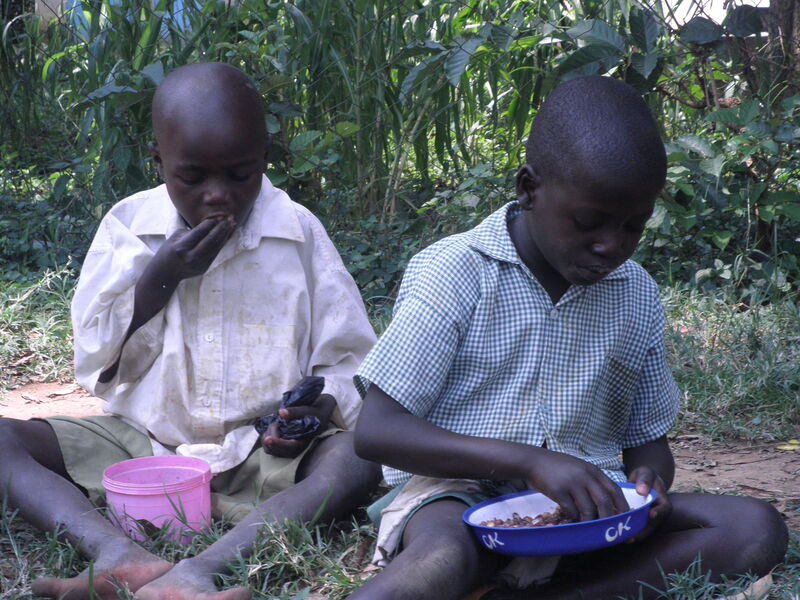 Since 2006, KCEP have been providing a free lunch of maize and beans to these vulnerable children every school day. There are approximately 700 pupils at the school, who along with the teachers, self-select the most deserving of the children to receive a free daily lunch. KCEP feed approximately one hundred and thirty children per day, many of whom are orphans or from single-parent families. Many of their parents have died from HIV, malaria or other diseases. The feeding programme costs approximately £6,000 a year and is currently funded through a lot of small donations from kind individuals and through small fundraising activities, such as, cake sales. We are currently aiming to access more secure funding from businesses or larger organisations.